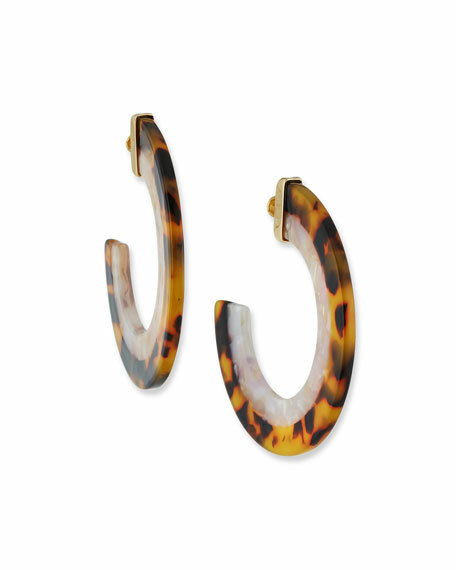 Deisy resin hoop earrings by BaubleBar. Shony golden plating and acetate hoops. Hofu earrings from Ashley Pittman. African horn and hand-inlaid bronze. Star-shaped stud accents at hoops. Post backs for pierced ears. Hofu earrings from Ashley Pittman. African horn and hand-inlaid bronze. Star-shaped stud accents at hoops. Post backs for pierced ears. Handcrafted in Kenya. Isadora small hoop earrings by BaubleBar. Shiny yellow golden plated hardware. Interior and exterior glass stones. Approx. 1.8"L drop; 0.3"W.
Isadora small hoop earrings by BaubleBar. Shiny yellow golden plated hardware. Interior and exterior glass stones. Approx. 1.8"L drop; 0.3"W. Surgical steel post backs. Imported.